undergoing a long-term facelift resulting in a combination of close knit neighborhoods, skyscrapers and parks that brings a whole new feel to Pittsburgh without erasing its history of immigration and industry. The Conservatory and Botanical Gardens are a great afternoon pastime, as is a hike up Mount Washington. Or, take one walk down Strip District to get a taste of the the various folk that call Pittsburgh home. hot and humid with highs in the 80s and occasionally 90s Fahrenheit (high 20s and low 30s Celsius), while winters are dreary with cold, cloudy weather and some snow. However, no matter what time of the year you visit, you’ll likely find affordable prices on hotels (though business travel in the spring and fall can affect prices) and plenty of things to do. Pittsburgh is an amazing city! There is fantastic food, excellent theater and music, an incredible concentration of art (Mattress Factory, the Warhol Museum, etc.) and science/history (Heinz History Museum, Carnegie Science Center, Carnegie Natural History... in fact most museums have fossils from our collection on display) museums, and spirited sporting venues to visit. We have more bars per capita and more bridges than any other city in the world - plus a very interesting history. Once the steel capital of the world whose iron forged many of the US's skyscrappers, Pittsburgh is now very green and a mecca for medicine and technology. The city is unpretentious and fun, regardless of what floats your boat. Kelly O's diner has been featured on diners, drive in's and dives and has good food. The other photo is the Heinz History Center. It has a lot of Pittsburgh history inside with pictures and stuff to see. Where's the summertime atttt yo? while i was in Pittsburgh all i can think about was summer...summer can hurry up now, please & thank you!!! Compact and lively...Pittsburgh's downtown offers a big-city ambiance... Restaurants... shops(limited)... busy sidewalks...invigorating architecture...good public transport....and the occasional street fair... along with the riverfront...downtown was a great place to stay while i was here! I live on a busy street.. Window is closed and the sound of the city is putting me to sleep! so happy my hotel was located here! A collection of neighborhoods that comprise nearly a third of the city...they are generically and perhaps unfairly referred to as the North side....Take a stroll in a unique urban park...visit the Andy Warhol Museum and the Mattress Factory Museum....walk towards downtown... just a short distance from downtown! These are the views remembered when its below zero degrees... Ride up one of the city's historic inclines to go up and return trip is six bucks per person! I loved crossing one of the many bridges in Pittsburgh the city is so clean many restaurants and green !! I LOVE THIS CITY! Sorry, don't mean to yell. Lived here for over 20 years and there is so much to see and do. It never gets old. I have family here, I have on gone on occions, when the opportunity arrives I for the most part have a good time. Located where the Allegheny and Monongahela rivers join. Pittsburgh was once one of the most important cities in the U.S., at the center of the steel trade, and an important shipping and railroad center. The city fell into hard times with the decline of industry and manufacturing, but it has definitely been making a come back. There are a lot of great cultural venues, and it is a big time sports town. It's becoming the "New Hotness". 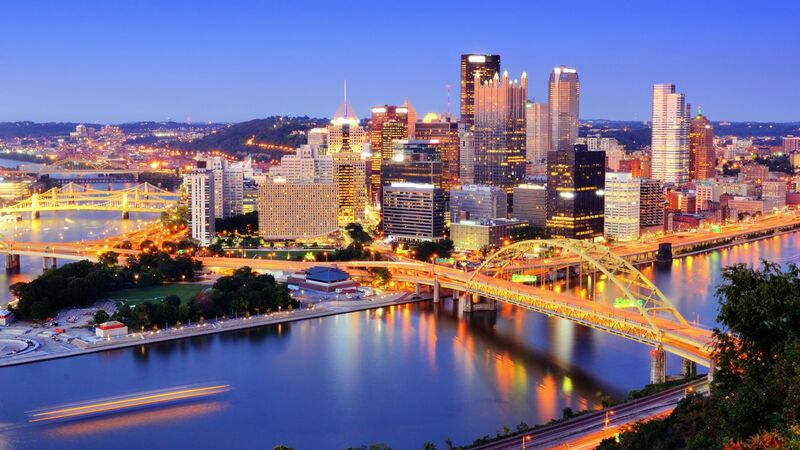 Take a visit for yourself why everyone is talking about Pittsburgh! Oddly revamped church into brewery. Intriguing stained glass with an out of date menu and music choice. Nice service, decent beer- and I just love sinning in public. My hometown: A great place to explore. I recommend you check it out; there's something here for everyone to enjoy (so don't let the "only 4 tribes tagged" fool you)!